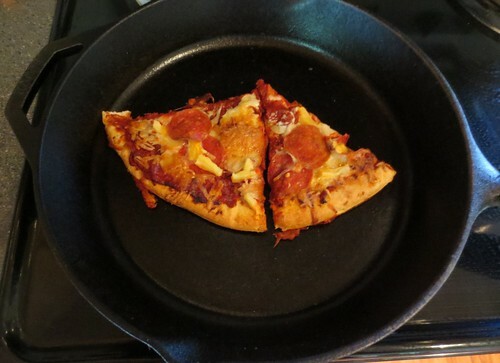 Place your leftover pizza slices in a cast iron pan on low-medium setting on the stove top burner. Make sure the pan doesn’t get too hot. As the pan gets warmer, check your pizza crust to make sure it isn’t getting too hot and burning the bottom. The key is to slowly warm the pizza which allows the crust to stay crispy and the topping to heat up. Putting a piece of foil over the pan also helps keep the heat in and warm the toppings. I found about 10-15 minutes is about right for the thicker homemade pizza I make. Great pizza that is warmed up perfectly!